A major aim of my Contemporary Art Cross-stitch practice is to push the boundaries of what cross-stitch can be, and attempt to create new ways of working within the medium. I began to experiment with painting on cross-stitch fabric, originally with the idea of stitching the black outlines, usually found in my paintings, onto the finished work. However, I didn’t like the finish on this work due to the distortion on the lines because of the grided fabric. I quickly moved on to adding embellishments to the work in cross-stitch, better utilising the grided nature of the Aida, rather than fighting against it trying to create smooth lines. I took an early, experimental piece of work with me to Athens in 2017. This work was based on the Ancient Greek Myth of Orpheus and Eurydice. In the myth, Eurydice dies and Orpheus journeys to the underworld to retrieve her. In ancient Greek pottery the images are often portrayed with Orpheus in colour (terracotta) and Eurydice in shades of white and grey to show that she is dead. 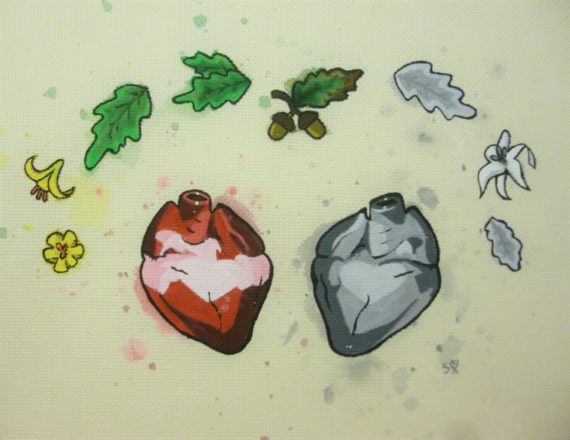 In my work, the red living heart represents Orpheus, while the grey heart is Eurydice. Silver thread has been used to embellish on one side, while gold has been used on the other. A major failing in this piece of work for me is the painted outlines. I have an obsession with outlining my work when painting and it can be hard to get over. I hate how it looks on the Aida, and so abandoned the painted outline on my next piece of work. UK based conceptual artist. 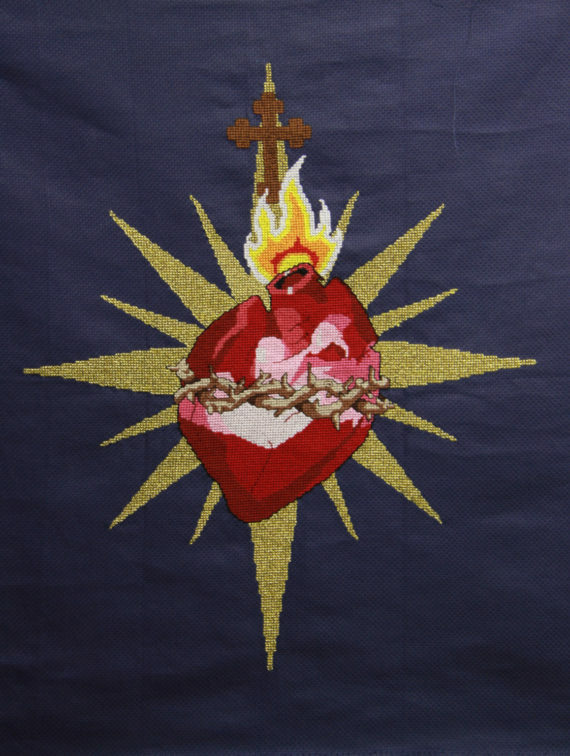 Multidisciplinary artist, primarily painting and Contemporary Art Cross-stitch.